People in the Southwest love spicy food. This often means adding chilies to our recipes. But before chilies were discovered in the Americas, the world was getting its flavor kicks from ginger, a spicy tropical root familiar to us all from the produce section of most grocery stores. But guess what? 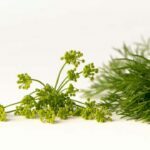 You can grow it at home. Ginger (Zingiber officinale) is a tropical perennial with thick, fleshy roots (sometimes called rhizomes) with a grey-brown skin. It has almost bamboo-like stems growing three to four feet tall with narrow, glossy leaves. It produces yellow flowers with purple claws. After flowering, the stems die back to the ground. The modern name for this root is a derivative of the Sanskrit word “singabera”, which means “shaped like a horn,” an apt description of the thick rhizomes. As the spice spread westward “singabera” became “zingiberi” to the Greeks and “zingiber” to the Romans. When this thick root reached the western edge of Europe, the English slurred the syllables to give us “ginger”. Ginger can be easily grown from fresh root purchased at grocery stores. Select firm, healthy looking rhizomes with no dried out or greenish-blue sections. Once you get it home, divide the root into several pieces, each with 2-3 growth buds. To reduce risk of rotting allow the cut ends to dry for several hours before planting. In our hot, dry climate ginger is best grown in ceramic or plastic pots to prevent it from drying out during the summer. Use a rich tropical potting soil. Plant rhizomes 2-3” deep in a pot at least 12” in diameter. Keep the soil moist but not water-logged until the plant emerges from the soil, about ten days after planting. Once the planbted ginger root gets going it puts up green spears like this. When you see this poking though your potting soil, start fertilizing your new ginger plant. Place your ginger pot in a spot where it can get at least four hours of sunlight. Shelter it from drying winds. During the heat of summer, move the ginger pots where it will get more shade. Fertilize monthly with a slow-release fertilizer to avoid burning the leaves. When fall arrives, bring your ginger indoors before cold temperatures arrive. It will die if exposed to near-freezing temperatures. If you live in a very dry region, try growing ginger indoors. Avoid placing it where it will be exposed to blasts from heating vents in winter. For healthy growth, mist the ginger leaves to compensate for the dry indoor air and use a grow light to supplement the natural light. And of course, keep the potting mix evenly moist as you would any tropical plant. 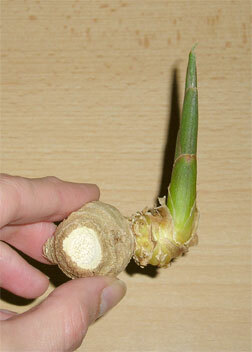 One section of ginger will produce three to six rhizomes (those thick sections of root). The rhizomes can be harvested for use any time. In an established bed or pot remove the roots on the edge. Clean them and allow the outer skin to dry before using in the kitchen. 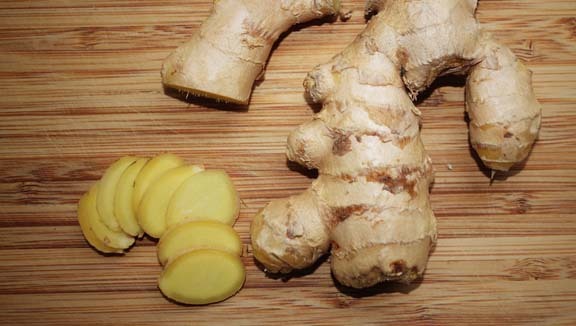 When you slice ginger root, be sure to use a sharp knife to cut through the fibrous sections. Ginger roots are very fibrous. 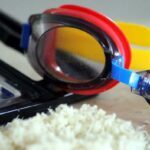 They require a sharp knife and a strong hand to slice or grate. When using whole pieces, be prepared to retrieve them out of sauces or stir-fry mixes before serving. It’s not any fun biting down on a tough section of ginger by mistake. For a home-grown taste of the tropics try planting ginger. They’ll add sparkle to your garden and spice to your kitchen.